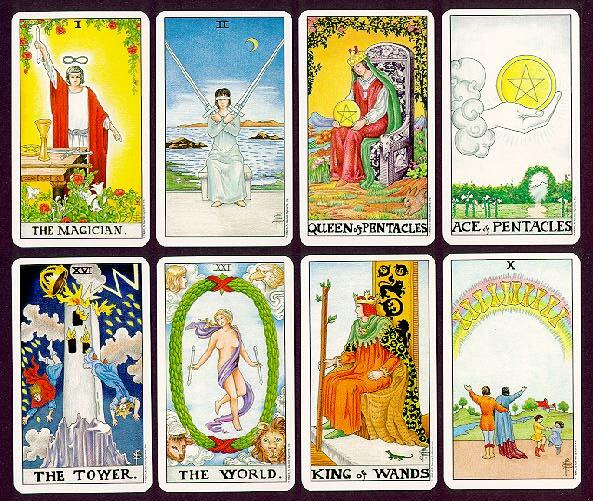 Book included: The Pictorial Key to the Tarot, by A.E. Waite. 340 pages, 4.2 x 7 inches, or 106 x 177 mm. Originally published 1910, this edition 1996, printed in the U.S. See notes below. Books: The book that accompanies this deck is A.E. Waite's classic notes on his own deck. Though you might think his remarks would be definitive, they are merely suggestive. He expects these notes to find occult students of a certain caliber, where his many hints would fall on fertile ground. As an introductory book for novices, it is only fair. Includes line drawing illustrations of each card. This set also includes a sheet of paper to spread the cards on. It measures 17.5 x 20.25 inches, or 44.5 x 51.6 cm.